The Forum Group Charitable Foundation chose to donate money to the aquaponics facility because its overall goal is to discover if aquaponics is profitable on a commercial scale. “They believe that we can help them discover the answer to this question,” says Draud. 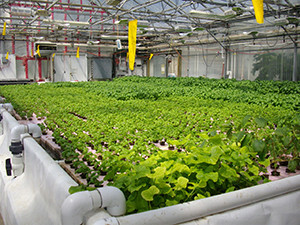 Currently, students and faculty from the University are involved in the aquaponics project. Thus far, those involved in the project are working to develop technologies and practices that reduce energy costs associated with heating and cooling of water and the pumping of water. Work is also being done to identify how to increase the efficiency of liquid and solid waste streams, as well as reducing the need to dump nutrients due to pH imbalance or over-nutrification. Finally, research on optimizing LED lighting for cost-efficiency is also underway. The team has decided to use a greenhouse as its facility, which is already built. Draud’s desire is to develop technologies that can make aquaponics profitable on a large scale because he thinks that soil-based agriculture is simply not sustainable in the long run. Eventually, the university plans to publish its work in peer-reviewed venues where the wider public can take advantage of what is discovered.